This morning we got up, cooked our breakfast, (bacon, beans, haggis and eggs) and decided to ride along the road to nowhere!! Our goal was Rannoch (train) Station, where the road ends but the train line continues on to Fort William and beyond. Our route was hilly at times, but with fantastic views - especially of the River Gaur - which was fast flowing and full!! When we arrived at Rannoch Station we found a small tea room along with a visitor's area that explained the history of the land and the railway, and it also provided information about various cycle routes including a long distance one called The Revolution Route - We thought this might suit our friends, Sharon and Paul down to a Tee!! As usual, we'd taken our own coffee and sustenance in the form of fruit cake, and once that was finished, as there was no where else to go, we about turned and cycled back the way we had come, but the head wind had other ideas and tried to delay our return. However, we bravely fought against it and won! On the way home we paced and raced each other and rode quite quickly over the switch back road beside Loch Rannoch, thus making our return journey much quicker and more fun than going - Oh and the distance - 31 miles in all and all before lunch! Therefore, a quick lunch was the next priority on our list but then we left Camp Kilvrecht and headed for Callander with the intention of trying to find an overnight camp on Loch Venachar, where there is supposed to be an Aire type camping spot. (like they have in France). However, after traversing the length of the Loch a couple of times and not being able to find either IT or level ground on other parking areas, we gave up and dropped back into Callander and had the misfortune of having to stop on another expensive commercial site, were we had to listen to our neighbours having ‘words’. To be fair we had a comfortable night and took full advantage of their hot showers (lovely after van affairs), but we left quite promptly in the morning. 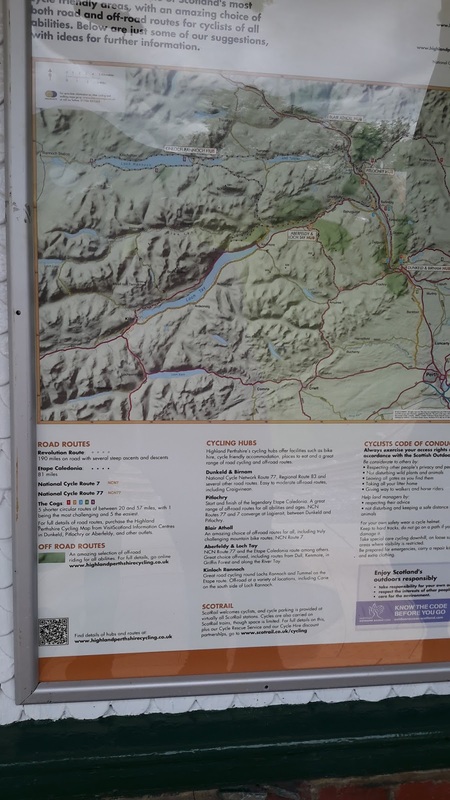 Following our prompt escape we headed towards Loch Lubnaig where our intention was to park the van for the day while we did a cycle ride up to Killin. Happily, it was here that we came across the Aire type camping spot that we had been searching for the day before. We nipped in quick, and found that for the sum of £10, we could park overnight, and they provide all that was needed to accommodate 2 vans and several tents. It is a lovely place right on the loch, side and there is a little food shack that sells all sorts of goodies up till 6pm. However, we were a bit narked when 2 more vans popped in and stayed overnight for free in the parking area that clearly said ‘no overnight parking’. 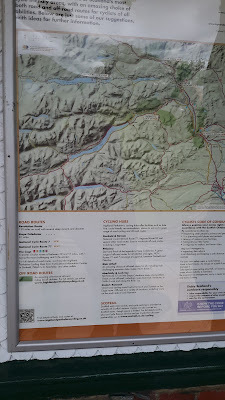 As we left the camp site we had to ride down the main A84 which is another old military road and one that was quite busy, but we only had about one and half miles to go before we picked up Sustran’s Route 7 which we diligently followed all the way to Killin. 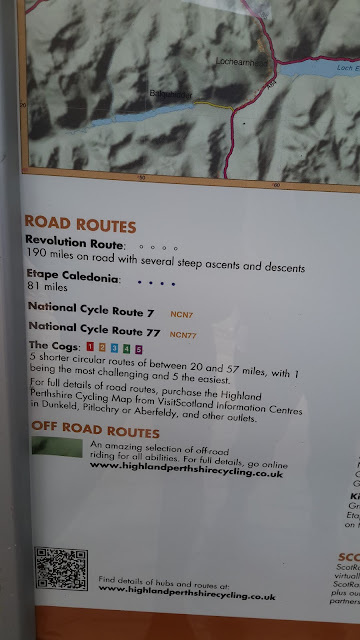 Route 7 follows the Rob Roy Way, and although it is mostly on good surfaces there are sections that proved to be very challenging, either due to their steepness or the rough terrain under our road tyres. In 2 places it gains height very quickly by using a series of hairpin bends - on the first we pushed because of the poor surface, but on the second we managed to ride to the top - although it nearly killed us. (the best thing about it was coming back down!). As we continued on our way we passed over a bridge that was dedicated to Nigel, and also over a huge viaduct. And then we noticed we'd ridden about 13 miles, and as we're getting 'on' a bit (old foggies our children would say) John decided it was time to stop for tablet ….. Mrs Tilly’s ….. it was very nice!! The part of the trail we'd ridden was quite hilly of the upwards variety, so it seemed fairly realistic to expect a bit of downhill as we got nearer to our destination. However, once the downhill started the path deteriorated and we continued to descend quite quickly for about 4 miles. At one point John shouted out ‘deer’, I was unsure if this was a term of endearment, or to signify that he had actually seen said animal. Unfortunately, by the time I looked up - from carefully watching my tyre placement - whatever it was had vanished! Anyway, after our hurtle downhill we finally made it to Killin in once piece, and then our first priority was lunch. I had brought our usual picnic with us but after 21 miles of fairly hard cycling we felt in need of a more substantial feed, and luckily we quickly spied The Old Smithy which had been converted to a fish and chip shop. I nipped in and brought a large portion of chips to share which went down extremely well with our ham cobs, and as it was still raining, and as they had outside tables and chairs with brollies over them we cheekily took advantage while we partook of our feast. After we'd eaten we felt much better so wondered around the village and took photos of the magnificent Falls of Dochart which were in full spate following the heavy rain overnight. By now it was about 3pm and we still had to cycle all the way back so John suggested staying on the main road for a while which would avoid some of the hills and rough terrain, so that is what we did. We followed the road for about 3 miles, all uphill, and then we were able to pick up the cycle track again. Luckily this made our return much easier - I wasn't sure if I would have made it had we gone the long way round! Once back on the cycle track we stopped off at a viewpoint overlooking the head of Loch Earn for coffee, and then later we found another spectacular waterfall which didn’t seem to have a name. Finally, to shorten our route again we did another section of main road, but as we rounded a blind bend we almost ran into a huge heap of sawdust protruding half way across the carriageway. It looked as if it had been very recently spilled because there was no warning signs, however, we safely passed it without incident, and a little further down the road found it’s source. The trailer of an artic was parked in a lay-by, and as we continued along the road the lorry driver, accompanied by a police car were returning. The ride in total was 38 miles, and because of all the hills we both felt quite exhausted by the time we got back, however, we keep telling ourselves ‘it's good for us’, and following a cup of tea we've decided to try and keep our new habit up!! Well, today our road has finally come to an end, and after 23 nights we have to leave Scotland and start making our way home. In total we've got about 400 miles to travel, but we plan to break our journey somewhere near Bridlington and finish it off tomorrow. At the moment I'm writing this as we're travelling along the A66 from Penrith to Scotch Corner, and from there we've probably got another couple of hours to go before we need to find somewhere to park up for the night - maybe we will do full circle and stop at Fylingdale again. Later we went into Bridlington for a fish and chip supper, and as I thought earlier we've parked up in one of our favourite spots on Fylingdale Moor. As we sat having our arrival cup of tea, we were lucky enough to see an owl fly by carrying prey in it's talons, and even more spectacularly, it has continued to entertain us by doing several more flybys. However, by the time John managed to get his camera out it had gone! We're now snug and settled and are going to have an early night because we have about 130 miles to go tomorrow, but we need to get back as early as poss because we've got a lot to squeeze in to the rest of the day. I've got an appointment with the dentist who I think might do something nasty, and then there are all the usual mundane tasks that have to be done when you return from a long holiday. Unfortunately, I also have to go back to work for my last few promised bank shifts! However, this will be our last holiday as such. Hopefully, the house sale will go through by the end of August, and then we'll be living the Dream and be full time in the Tardis and off on our travels for real! !